When Office “solutions” are causing more stress than anything else, it’s time for a change. 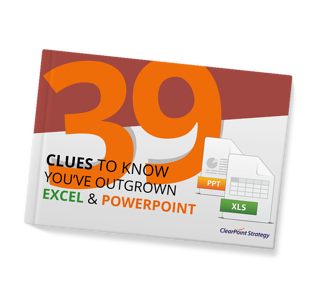 Maybe your company is hanging on to Excel and PowerPoint for reporting because everyone is familiar with it, or (quite frankly) it’s all you’ve ever used. But as your business grows, you need your reporting software to grow, too. Using a system you’ve outgrown breeds frustration and invites inaccuracies—two things you’d rather do without. Download the complete list to see if your business is ready for a new way to do reporting.